On a day-to-day basis, I find myself plagued with digital garbage and poorly printed bulk runs by the advertising industry. 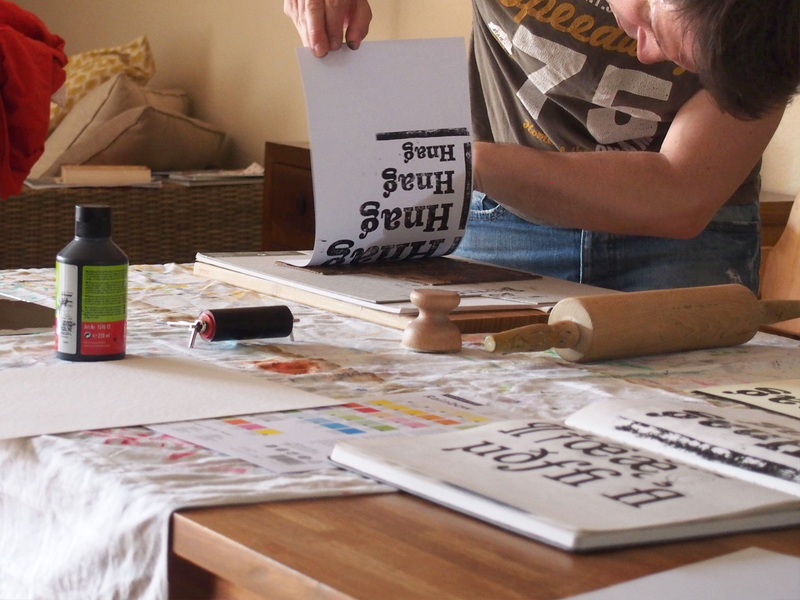 Therefore, you cannot imagine how much a hand drawn logotype or a letterpress product in my mailbox brightens my day. 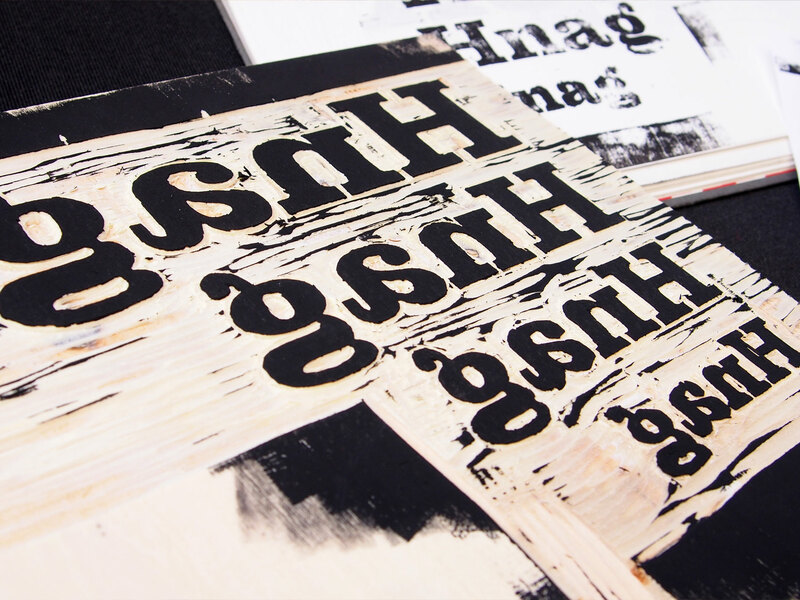 The warmth of manually printed matter demonstrates a special effort and has become a sign of quality and good taste. Unfortunately, in my everyday life as a graphic designer I rarely have the time to draw letters by hand or the budget to order a lavishly produced short run. Kontiki can help. 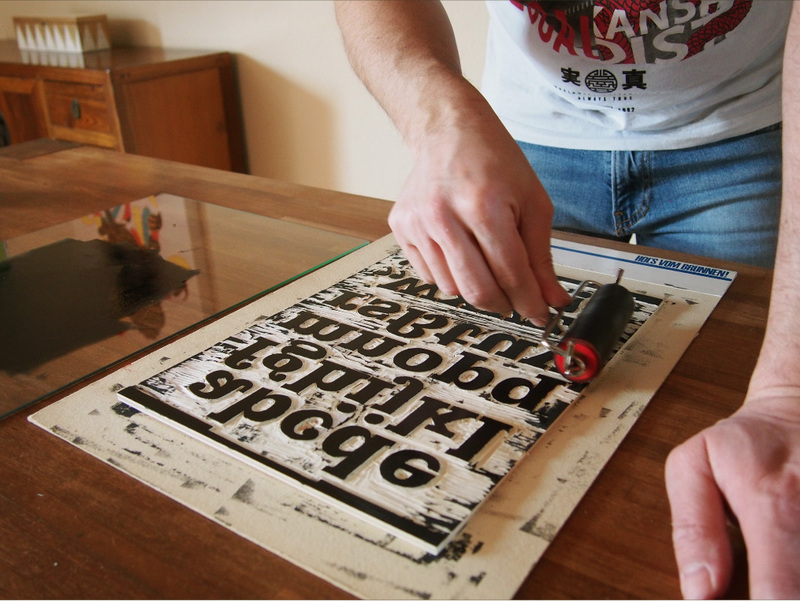 The typeface digitally simulates a handmade woodprint, but is less expensive to produce and easier to correct. 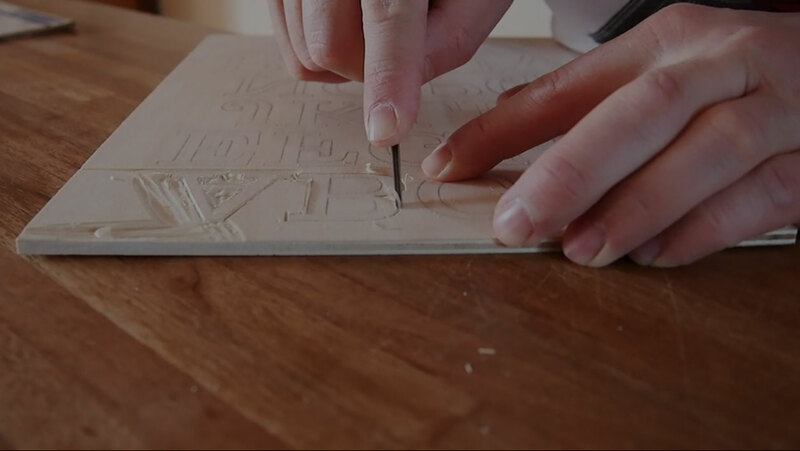 It offers a designer the possibility to create a printed image that is very close to a traditional woodcut. 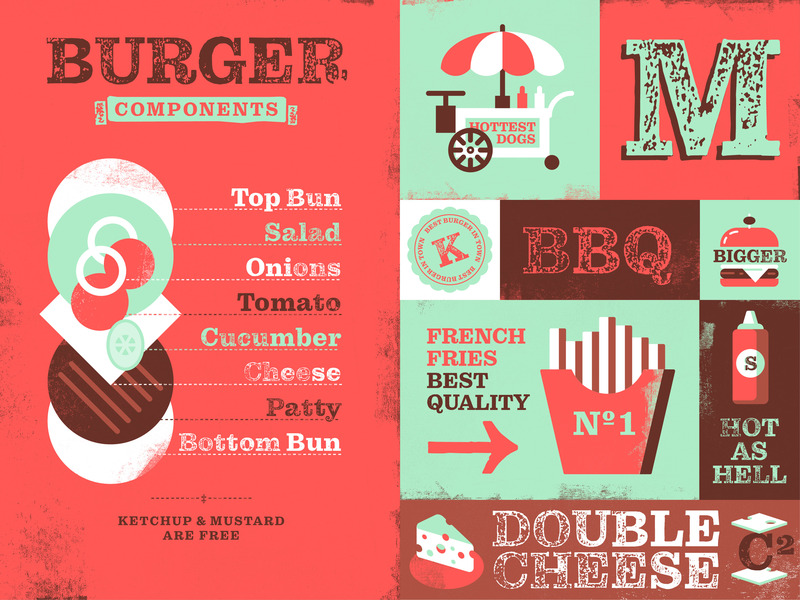 Kontiki is available at MyFonts and at Abobe Fonts under the name “Pulpo Rust”. Thor Heyerdahl was a Norwegian adventurer and ethnographer with a background in zoology, botany, and geography. Mit seiner Expedition konnte er beweisen, dass es den präkolumbischen Indianern Südamerikas technisch möglich war, Polynesien zu besiedeln. Thor Heyerdahl wurde in Larvik geboren, wo sein aus Christiania stammender Vater eine Brauerei betrieb. Als einziger Nachkomme ältlicher Eltern wuchs er sehr behütet und verhätschelt auf, hatte aber auch große Freiheiten: Für Thors Sammlung von Kleintieren, Käfern, Insekten und Vogeleiern stellte der Vater auf dem Brauereigelände einen renovierten Raum zur Verfügung, den der Junge stolz »Zoologisches Museum« nannte. Als Kind hatte er Angst vor dem Wasser, nachdem er zweimal beinahe ertrunken wäre. Sogar als Jugendlicher weigerte er sich, Schwimmen zu lernen, bis er 1937 auf Tahiti in einen reißenden Fluss stürzte und um sein Leben kämpfen musste. Für Sport, ausgenommen Laufen und Klettern, interessierte er sich im Gegensatz zu seinen Schulkameraden nicht, war aber gern mit Zelt und Schlafsack im nahen Gebirge unterwegs. Ola Bjørneby, ein erwachsener Einzelgänger, der auf der verlassenen Alm Hynna in einem Schafstall hauste und sich mit einem Mobiliar aus Baumstümpfen, Steinen und Tannenzweigen zu begnügen verstand, brachte den Jungen auf den Geschmack für ein Leben unter primitivsten Bedingungen. Bereits zu dieser Zeit entstand der ernsthafte Wunsch, einige Zeit in einer von der Zivilisation möglichst unberührten Gegend zu verbringen. Im Jahr 1933 begann Heyerdahl das Studium der Zoologie und der Geografie an der Universität Oslo. Seine Zoologieprofessorin Kristine Bonnevie befasste ihre Schüler aber auch mit physischer Anthropologie. Auch stand Heyerdahl die damals größte Bibliothek über Polynesien von Bjarne Kroepelien zur Verfügung. Der Student Heyerdahl war bereits vor seiner Abreise so belesen, dass er Vorträge über die Marquesas halten konnte. Heyerdahl was born in Larvik, Norway, the son of master brewer Thor Heyerdahl and his wife, Alison Lyng. As a young child, Heyerdahl showed a strong interest in zoology. He created a small museum in his childhood home, with a common adder as the main attraction. He studied zoology and geography at the faculty of biological science at the University of Oslo. At the same time, he privately studied Polynesian culture and history, consulting what was then the world's largest private collection of books and papers on Polynesia, owned by Bjarne Kroepelien, a wealthy wine merchant in Oslo. (This collection was later purchased by the University of Oslo Library from Kroepelien's heirs and was attached to the Kon-Tiki Museum research department.) After seven terms and consultations with experts in Berlin, a project was developed and sponsored by Heyerdahl's zoology professors, Kristine Bonnevie and Hjalmar Broch. He was to visit some isolated Pacific island groups and study how the local animals had found their way there. Just before sailing together to the Marquesas Islands in 1936, Heyerdahl married his first wife, Liv Coucheron-Torp, whom he had met shortly before enrolling at the university, and who had studied economics there. The couple had two sons; Thor Jr and Bjørn. The marriage ended in divorce. After the Occupation of Norway by Nazi Germany, he served with the Free Norwegian Forces from 1944, in the far north province of Finnmark. In 1949, Heyerdahl married Yvonne Dedekam-Simonsen (1924–2006). They had three daughters: Annette, Marian and Helene Elisabeth. They were divorced in 1969. Heyerdahl blamed their separation on his being away from home and differences in their ideas for bringing up children. In his autobiography, he concluded that he should take the entire blame for their separation. In 1991, Heyerdahl married Jacqueline Beer (born 1932) as his third wife. They lived in Tenerife, Canary Islands and were very actively involved with archaeological projects, especially in Túcume, Peru, and Azov until his death in 2002. He still had been hoping to undertake an archaeological project in Samoa before he died. Thor Heyerdahl (Larvik, Noruega, 6 de octubre de 1914 – Andora, Italia, 18 de abril de 2002) fue un aventurero y etnógrafo noruego. También se dedicó al estudio de la zoología, la botánica y la geografía. Alcanzó renombre mundial por organizar la expedición Kon-Tiki en 1947, durante la cual recorrió 8000 km a lo largo del océano Pacífico, desde las costas de Sudamérica hasta el archipiélago Tuamotu, a bordo de una balsa artesanal. Este viaje estuvo diseñado para intentar demostrar que los pueblos de la Antigüedad pudieron realizar largos viajes oceánicos que pusieran en contacto a culturas separadas, lo cual está estrechamente relacionado con un modelo difusionista de desarrollo cultural. Heyerdahl completó otros viajes destinados a demostrar la posibilidad de contacto entre pueblos antiguos muy distantes, caso de la expedición Ra II en 1970, que le llevó a navegar desde la costa occidental de África hasta Barbados sobre una balsa de juncos de papiro. Thor Heyerdahl naît en 1914 dans la petite ville norvégienne de Larvik. Il s'intéresse très tôt à la zoologie, puis à l'ethnographie. Il se passionne pour l'étude du peuplement des îles polynésiennes, et, se basant sur des indices concordant du matériel archéologique et anthropologique des peuples polynésiens et de ceux du continent américain, il échafaude une hypothèse d'une expansion dans l'océan Pacifique venant de l'Est, contre la théorie admise jusqu'alors d'un peuplement venant de l'Asie du Sud-Est. Cette nouvelle théorie est accueillie fraîchement, il décide donc de l'étayer en entreprenant en 1947 de reproduire, dans les conditions de l'époque préhistorique, le voyage d'Amérindiens à la dérive à travers le Pacifique. Il part de Callao au Pérou avec cinq équipiers sur un radeau de troncs de balsa, baptisé Kon-Tiki, et au bout de trois mois atteint les îles Tuamotou : lui et ses cinq compagnons échouent sur l'atoll Raroia. Le livre qu'il écrit, L'Expédition du Kon-Tiki. 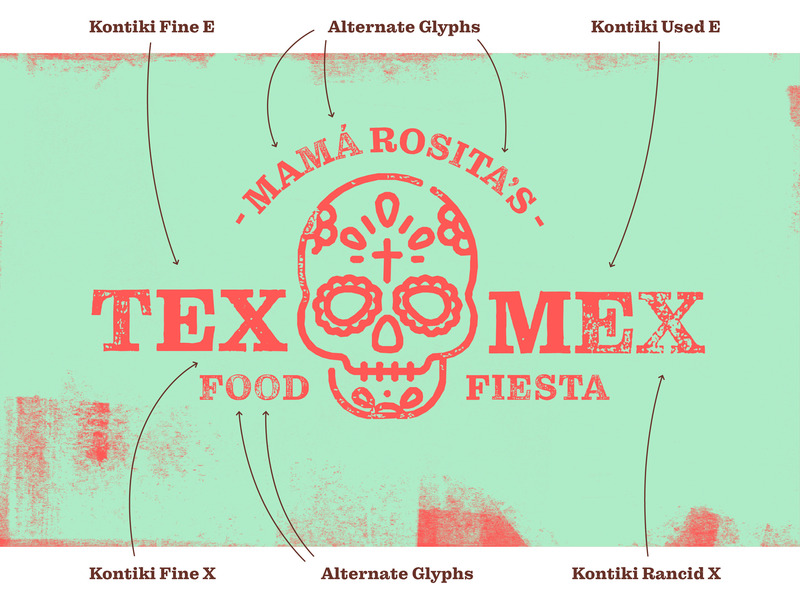 The Kontiki Family has 4 styles as single fonts with 560 glyphs each, featuring four different qualities of print. The Pro version contains all 2240 glyphs as “stylistic alternates” in one font with optimized kerning for all style combinations offers the “contextual alternates” feature. 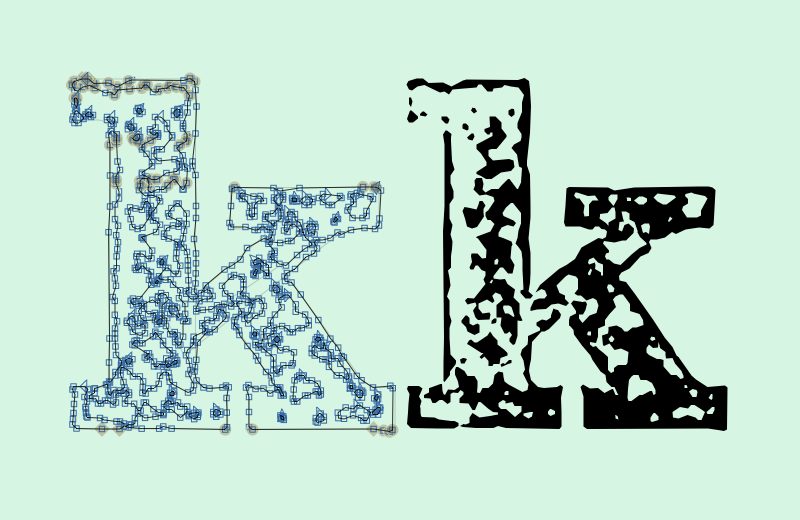 This OpenType feature generates an automatic variation of glyphs with randomized selection. All customers of the Pro Version will get all single fonts of the family for free. 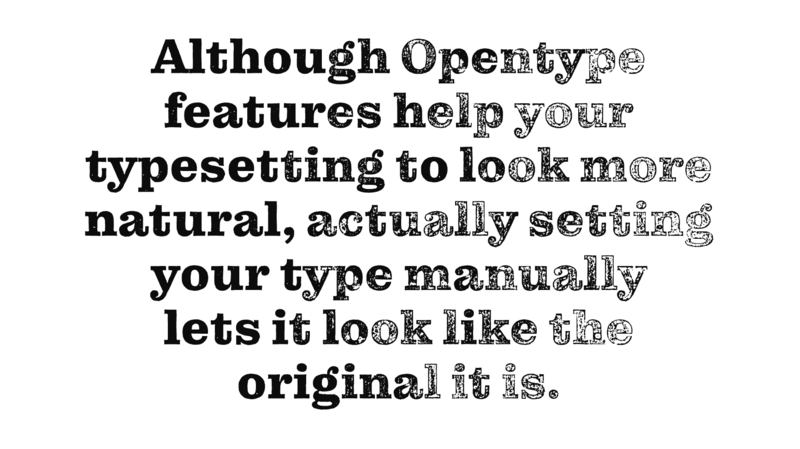 If you have no access to these opentype features with your layout software, it may be better to use the smaller single font files, but if you would like to have optimized kerning for all letters, use the Pro version. Kontiki offers various sets of numerals and mathematical signs, as well as common currency symbols in all four styles. To meet the needs of global communication it has a wide range of language support and supports all western-, eastern- and central-European languages. 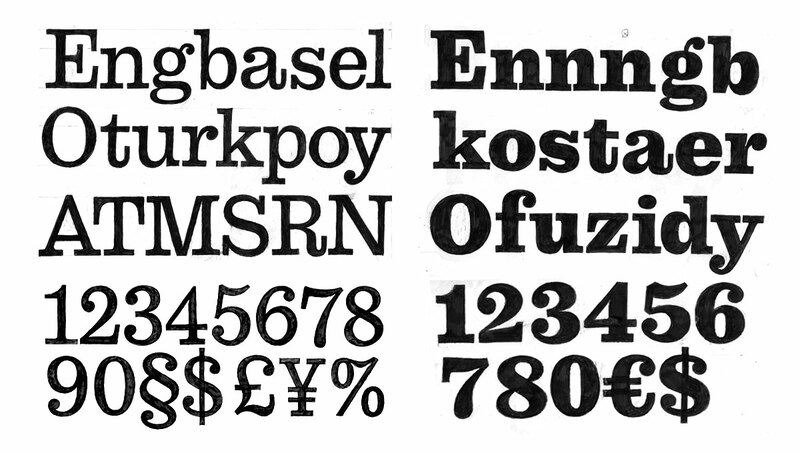 The OpenType format allows you to include different character variants within a single font file, so that there is no need to have separate fonts for Tabular Figures, Old Style Figures, Small Caps and so on. The desired format can be activated within the layout application (such as Adobe InDesign or Illustrator etc). OpenType features can also be used in website layouts. You can easily style your text with OpenType features using various CSS expressions – but make sure that your browser supports the features you’re using. 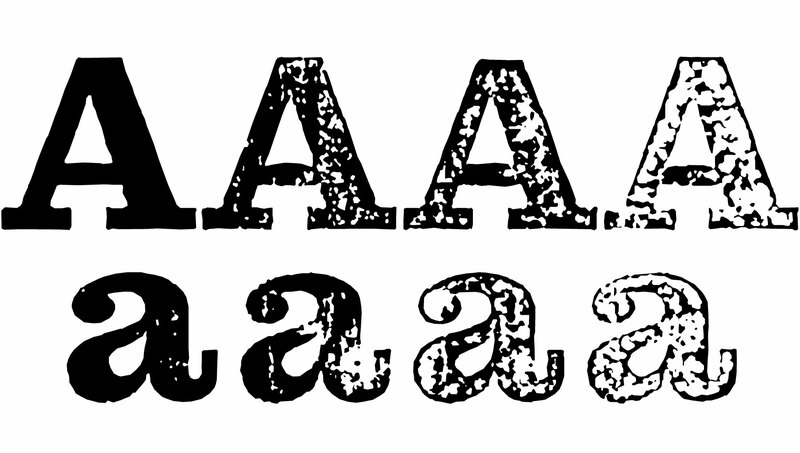 Standard ligatures are designed to improve the kerning and legibility of certain letter pairs. For example, when this feature is activated, typing ‘f’ and ‘i’ will automatically produce the ‘fi’ ligature. Using ligatures does not affect the spelling and hyphenation of your text in any way. Tabular figures (TF) are for use in tables where numerals need to be aligned vertically. 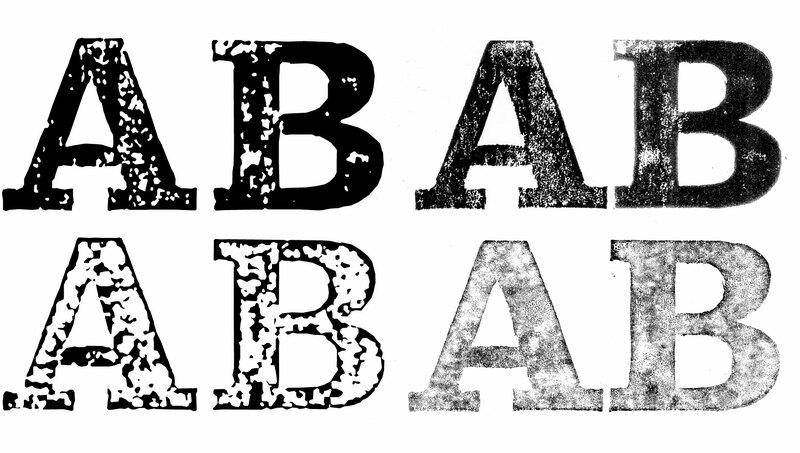 Tabular figures are available as a OpenType feature and have a fixed width in all styles. In Kontiki fonts also old-style tabular figures are included. The proportional old-style figures feature changes standard figures to old-style figures which work well in running text, as they have the same proportions as lower case letters with their ascenders and descenders. There are also matching currency symbols for these numbers. Replaces all styles of figures (old-style, tabular, lining) and letters with their superior alternates, which can be used for footnotes, formulas, etc. 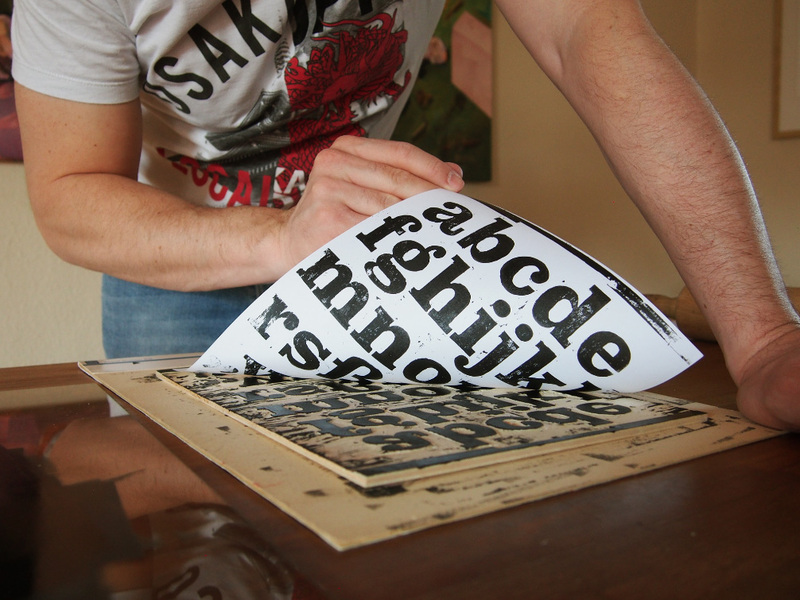 Superior characters are adapted in stroke weight and are also spaced more generously. Similar to the superscript numbers it replaces all styles of figures with their subscript alternates. Mainly the subscript feature is used to set formulas. Besides the included standard fractions, other arbitrary fractions could be easily done by using the fraction feature, which converts numerals in combination with a slash into fractions oriented to the capital height. 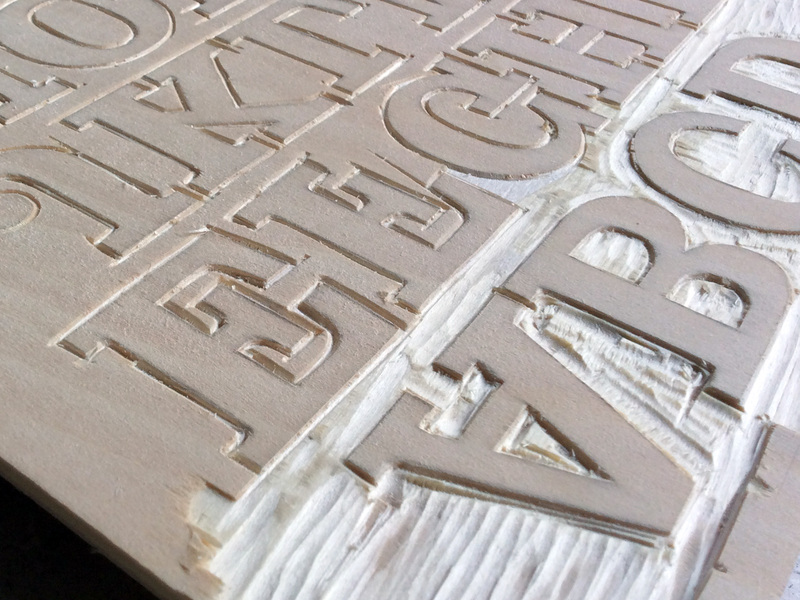 The warmth and beauty of type made from woodcuts my wife Pia Kolle had carved, inspired me to cut a full set of glyphs for my own manual printrun. To start with, I decided to draw a Clarendon style bold typeface, reminiscent of a foregone era of wanted posters and circus advertisements. There are two ways to design a Clarendon: 1) Reducing the contrast of a Scotch Roman or 2) adding serifs to a Sans. As one of my favorite typefaces, Century Schoolbook, is based on the Scotch model I decided to sketch a Clarendon on that basis. A light and a black weight were digitized and interpolated to generate a bold weight to be cut in wood. 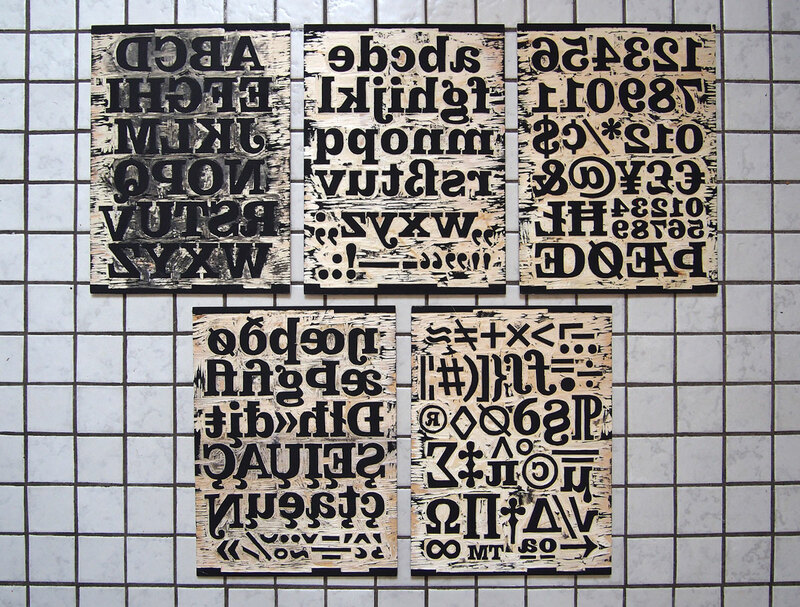 After testing different techniques and sizes, I settled on a woodcut in a size of around 150 points and cut a total of five plates to complete a full set of glyphs. The choice of paper was also a difficult task. Eventually, I chose a matte coated printing paper with a very smooth surface, because I wanted to show the misprints in the printed image and not the effects caused by the structure of the paper. I printed all plates in an edition of 30 and chose four different qualities for digitalization: a print with full pressure, a half pressure print, and two subsequent prints without re-inking. After selecting the best quality prints, the complete set was scanned and all same style glyphs were compiled into a single pixel file. After a couple of test runs I chose Georg Seifert’s helpful Glyphs extension “Trace Image” based on Peter Selinger’s great open-source vectorizer “Potrace” to transform the pixels into vectors. Prior to vectorizing, I had to simplify the scans by using Gaussian Blur and Median filter and transform them into bitmaps. While it pained me remove all the lovely detailing, it was necessary to keep the file size as small as possible. To be a well performing font, a glyph should have around 1000 nodes as a maximum, and all its curves should be replaced by straight lines. 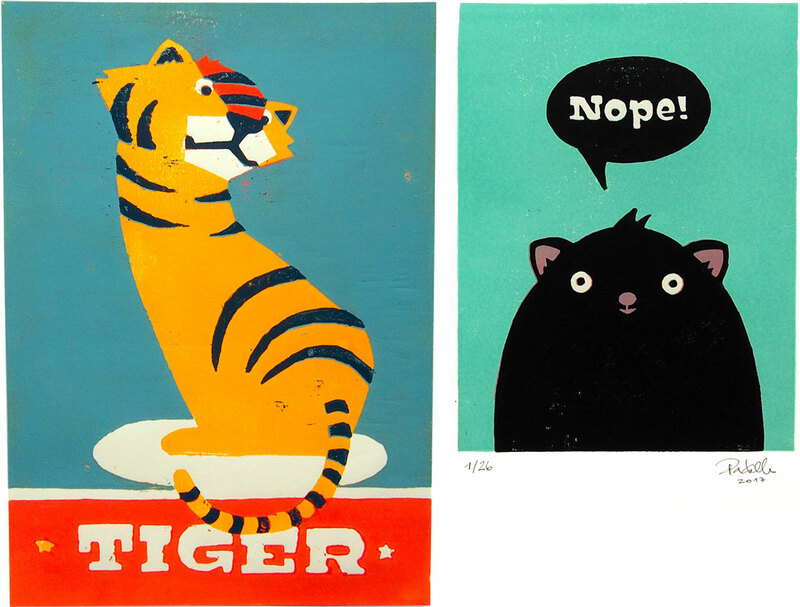 Residing in Cologne Germany, Felix Braden, the designer behind Kontiki, has a background in graphic design. 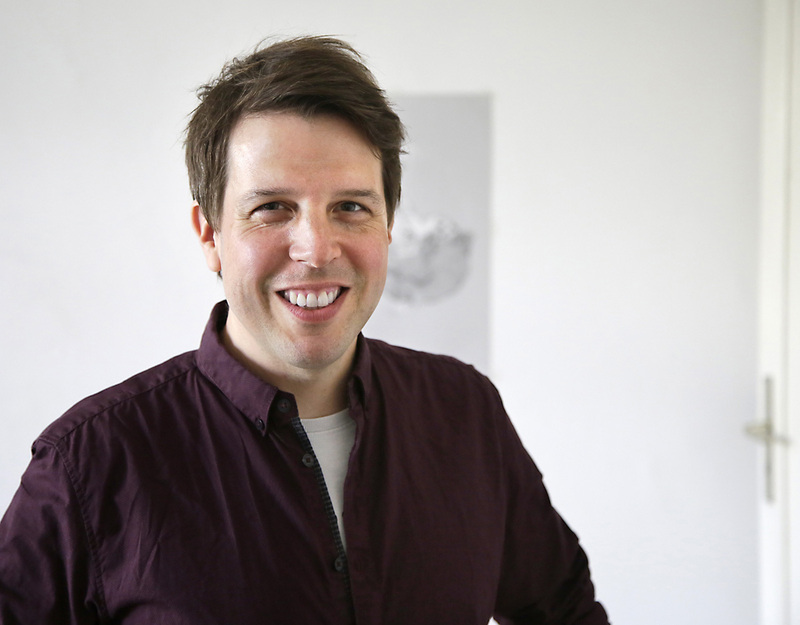 He studied Communication Design at Trier University of Applied Sciences with Prof. Andreas Hogan and worked with Jens Gehlhaar at Gaga Design. 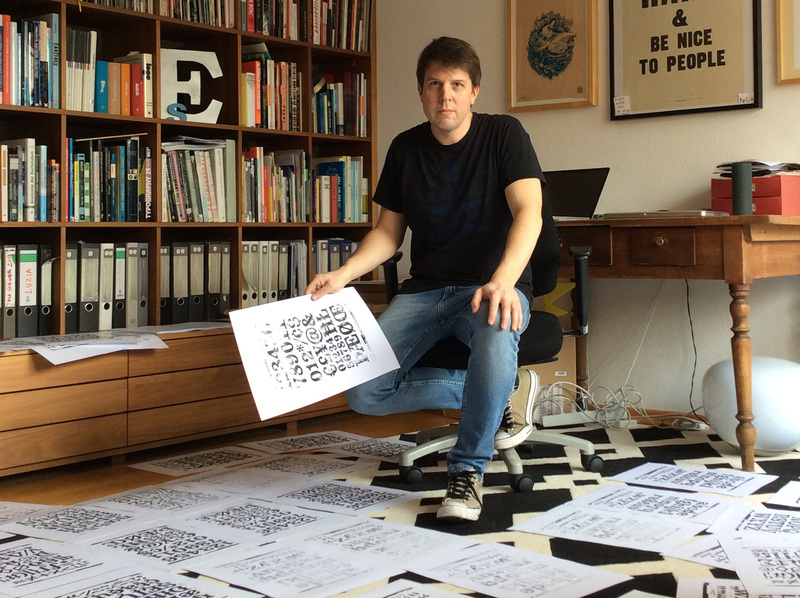 He co-founded Glashaus Design, is an art director at MWK Cologne and works as a freelance type designer. In 2000, he founded the free font foundry, Floodfonts, and designed numerous free typefaces, which are available as webfonts via Adobe Typekit. His commercial fonts are distributed by FontShop International (FF Scuba), Floodfonts (Capri, Sadness, Grimoire), URW++ (Supernormale), Volcanotype (Bikini) and Ligature Inc (Tuna, as a cooperation with Alex Rütten) and are all available via MyFonts. FF Scuba is one of the winners of the Communication Arts Typography Annual 2013, and was an honorable mention in Typographica’s Favorite Typefaces of 2012, in Typefacts Best Fonts of 2012, in FontShop’s Best Types 2012, and in Typecache’s Favorite Typefaces of 2012. Kontiki was nominated for the German Design Award 2019. Thanks to my wife Pia Kolle for inspiration and photography, Alex Rütten for programming this website and all those helpful hints on the design, Jessica Rosenfeld for the englisch translation, Ines Ruden for the portrait photo, Sven Fuchs, Guido Schneider, Stefan Claudius, Albert Jan Pool, Hrant Papazian for corrections on the Clarendon typeface, Ulrike Rausch and R.E. Scheichelbauer for helping to code the OpenType features, Georg Seifert and Peter Selinger for programming free extensions and tools. Thanks for all those wonderful icons made by Smashicons, Prettycons and Freepik from www.flaticon.com. And finally I am grateful to Christian Pannicke, Daniel Hannaske, Pia Kolle, Alex Rütten, Florian Hardwig, Frank Rausch and Florian Fecher for beta testing the font files. Nachstehend informieren wir Sie über Art, Umfang und Zweck der Verarbeitung Ihrer personenbezogenen Daten bei der Nutzung unserer Internetseite unter der Adresse „www.floodfonts.com“. Personenbezogene Daten sind alle Informationen, die sich auf eine identifizierte oder identifizierbare natürliche Person beziehen. Verantwortlicher im Sinne der EU-Datenschutzgrundverordnung (DSGVO) ist diejenige natürliche oder juristische Person, die allein oder gemeinsam mit anderen über die Zwecke und Mittel der Verarbeitung von personenbezogenen Daten entscheidet. Für die von dieser Internetseite verarbeiteten personenbezogenen Daten ist Verantwortlicher im Sinne der DSGVO: Felix Braden, Brohler Str. 17, 50968 Köln, Deutschland, Telefon: +49 221 5348136, E-Mail: info@felixbraden.de (im Folgenden „wir“). Wenn Sie uns eine Nachricht per E-Mail schicken, speichern wir Ihre Nachricht mit den damit übermittelten Absenderdaten (Name, E-Mail-Adresse und ggf. weitere von Ihrem E-Mail-Programm und den übermittelnden Servern hinzugefügte Informationen). Für den Empfang, die Speicherung und den Versand von E-Mails nutzen wir einen E-Mail-Anbieter, der für uns als Auftragsverarbeiter im Einklang mit Artikel 28 DSGVO tätig wird. Rechtsgrundlage für diese Datenverarbeitung ist unser berechtigtes Interesse, Ihre Nachricht zu beantworten und auch auf eventuelle Folgefragen von Ihnen reagieren zu können (Artikel 6 Absatz 1 Buchstabe f DSGVO). Wir löschen die mit Ihrer Nachricht erhobenen Daten spätestens zwölf Monate nach der letzten mit Ihnen geführten Kommunikation zu Ihrem Anliegen, vorbehaltlich der Reglung im folgenden Absatz. Wenn Sie unsere Internetseite besuchen, legen wir ein „Cookie“ auf Ihrem Endgerät ab. Dabei handelt es sich um eine kleine Textdatei, mit der wir Ihr Endgerät wiedererkennen können, wenn Sie unsere Internetseite zu späterer Gelegenheit wieder besuchen. Mit Hilfe des Cookies können wir auch bestimmte Nutzerverhalten analysieren, z.B., welche Produkte Sie sich anschauen, wie lange Sie auf unserer Seite bleiben und wann und wie oft Sie zu unserer Internetseite zurückkehren. Wir löschen ein abgelegtes Cookie spätestens zwölf Monate nach Ihrem letzten Besuch unserer Internetseite. Diese Datenverarbeitung erfolgt auf Grundlage von Artikel 6 Absatz 1 Buchstabe f DSGVO zu dem Zweck, unser Produktangebot noch besser auf die Wünsche unserer Besucher auszurichten, und die Funktionen unserer Internetseite und die Effizienz von Werbemaßnahmen zu optimieren. Sie können das Anlegen von Cookies verhindern, indem Sie in die Cookie-Einstellungen Ihres Internetbrowsers gehen und dort für unsere Seite oder für alle Webseiten dem Anlegen von Cookies widersprechen. Dort können Sie auch bereits abgelegte Cookies wieder löschen. Auf unserer Internetseite können Social-Media-Buttons eingeblendet sein; sie sind an den Logos der Social-Media-Plattformen (im Folgenden „Plattformen“) zu erkennen (Facebook: „f“-Logo, Twitter: Vogel-Silhouette, Behance: „Be“-Logo). Es handelt sich dabei um Links zu den jeweiligen Plattformen mit Sitz in den USA. Ein Klick auf einen solchen Link ruft die Internetseite der jeweiligen Plattform auf, wobei die IP-Adresse des aufrufenden Endgeräts sowie die Adresse der Seite, von der aus verlinkt wird („Referrer“), an die aufgerufene Plattform in die USA übermittelt werden. Von uns selbst werden im Zusammenhang mit den Social-Media-Buttons jedoch keine Daten erhoben oder verarbeitet. Bezüglich der personenbezogenen Daten, die wir über Sie verarbeiten, stehen Ihnen die folgenden Rechte zu: Sie haben das Recht, von uns eine Bestätigung darüber zu verlangen, ob wir Sie betreffende personenbezogene Daten verarbeiten. Ist dies der Fall, so teilen wir Ihnen die über Sie gespeicherten personenbezogenen Daten und die weiteren Informationen gemäß Artikel 15 Abs. 1 u. 2 DSGVO mit. Sie haben das Recht, Sie betreffende unrichtige personenbezogene Daten unverzüglich berichtigen zu lassen. Unter Berücksichtigung der Zwecke der Verarbeitung haben Sie auch das Recht, die Vervollständigung unvollständiger personenbezogener Daten – auch mittels einer ergänzenden Erklärung – zu verlangen. Sie können von uns die unverzügliche Löschung der Sie betreffenden personenbezogenen Daten unter den Voraussetzungen von Artikel 17 Absatz 1 DSGVO verlangen, soweit deren Verarbeitung nicht gemäß Artikel 17 Absatz 3 DSGVO erforderlich ist. Sie können von uns die Einschränkung der Verarbeitung Ihrer Daten verlangen, wenn eine der Voraussetzungen von Artikel 18 Absatz 1 DSGVO vorliegt. Sie können die Einschränkung insbesondere anstelle einer Löschung verlangen. Wir werden jede Berichtigung oder Löschung Ihrer personenbezogenen Daten und eine Einschränkung der Verarbeitung allen Empfängern mitteilen, denen wir Sie betreffende personenbezogene Daten offengelegt haben, es sei denn, dies erweist sich als unmöglich oder ist mit einem unverhältnismäßigen Aufwand verbunden. Wir werden Sie zudem über diese Empfänger unterrichten, wenn Sie dies verlangen. Sie haben das Recht, die personenbezogenen Daten, die Sie uns bereitgestellt haben, in einem strukturierten, gängigen und maschinenlesbaren Format zu erhalten, und können verlangen, dass wir diese Daten einem anderen Verantwortlichen ohne Behinderung übermitteln, soweit dies technisch möglich ist. Soweit eine Datenverarbeitung auf Ihrer Einwilligung beruht, haben Sie das Recht, Ihre Einwilligung jederzeit zu widerrufen. Durch den Widerruf der Einwilligung wird die Rechtmäßigkeit der Datenverarbeitung, die bis zu Ihrem Widerruf erfolgt ist, nicht berührt. WIDERSPRUCHSRECHT: AUS GRÜNDEN, DIE SICH AUS IHRER BESONDEREN SITUATION ERGEBEN, KÖNNEN SIE JEDERZEIT DER VERARBEITUNG DER SIE BETREFFENDEN PERSONENBEZOGENEN DATEN WIDERSPRECHEN; dieses Widerspruchsrecht besteht in Bezug auf diejenige Datenverarbeitung, die auf Grundlage von Artikel 6 Absatz 1 Buchstabe f DSGVO zur Wahrung berechtigter Interessen unsererseits oder eines Dritten erfolgt, sofern nicht Ihre Interessen oder Grundrechte und Grundfreiheiten, die den Schutz personenbezogener Daten erfordern, überwiegen. Wenn Sie Ihr Widerspruchsrecht ausüben, werden wir die betreffenden Daten nicht mehr verarbeiten, es sei denn, dass wir zwingende schutzwürdige Gründe für die Verarbeitung nachweisen können, die die Interessen, Rechte und Freiheiten von Ihnen überwiegen, oder dass die Verarbeitung der Geltendmachung, Ausübung oder Verteidigung von Rechtsansprüchen dient. FÜR DEN FALL, DASS WIR PERSONENBEZOGENE DATEN FÜR DIE DIREKTWERBUNG (Z.B. NEWSLETTER) VERARBEITEN, KÖNNEN SIE JEDERZEIT WIDERSPRUCH GEGEN DIE VERARBEITUNG DER SIE BETREFFENDEN PERSONENBEZOGENEN DATEN ZUM ZWECKE DERARTIGER WERBUNG EINLEGEN MIT DER FOLGE, DASS WIR IHRE DATEN FÜR DIESE ZWECKE NICHT MEHR VERARBEITEN WERDEN. Wenn Sie der Ansicht sind, dass die Verarbeitung Ihrer personenbezogenen Daten gegen die DSGVO verstößt, können Sie Beschwerde einlegen bei einer Aufsichtsbehörde, insbesondere in dem Mitgliedstaat Ihres Aufenthaltsorts, Ihres Arbeitsplatzes oder des Orts des mutmaßlichen Verstoßes. Das schließt anderweitige behördliche oder gerichtliche Rechtsbehelfe nicht aus.